Prize: We're excited to be offering 150+ Days of Giveaways in conjunction with our Holiday Gift Guides. 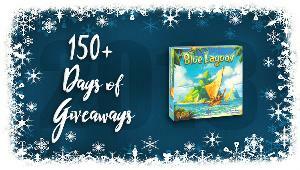 One lucky SahmReviews.com winner will receive a copy of Blue Lagoon from Blue Orange Games (ARV $33)! Statistics: This contest was opened by 21 and entered by 2 ContestChest.com members. 10% of those who opened the contest, entered it.